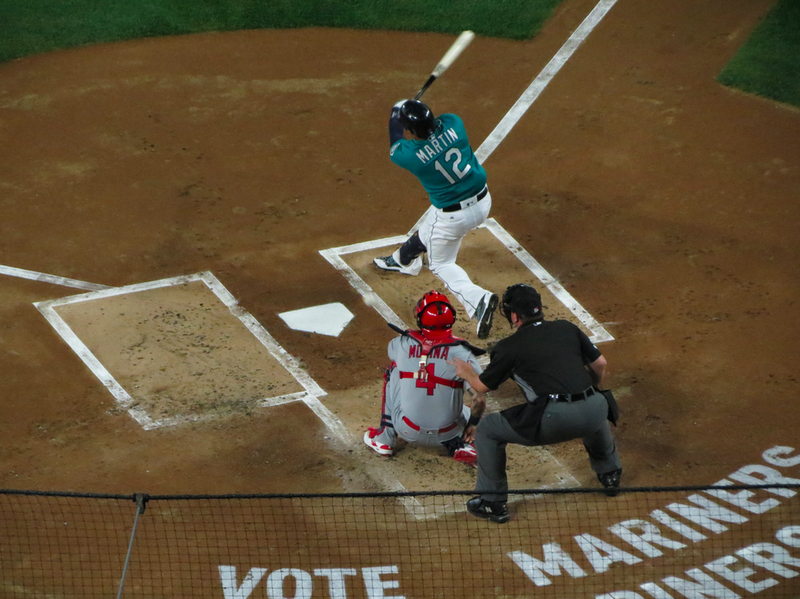 I was fortunate enough to be in attendance at last Friday’s game against the St Louis Cardinals to witness – sort of – what turned from a predictably-Mariners game to a different kind of game altogether. I had come to the sudden realization earlier that day that the two teams hadn’t seen each other in around three years, and both are now very different teams. I figured we were in for an interesting game; I just didn’t know how interesting. By now pretty much all the locals know what happened, so I’m just here to drop some photos off. 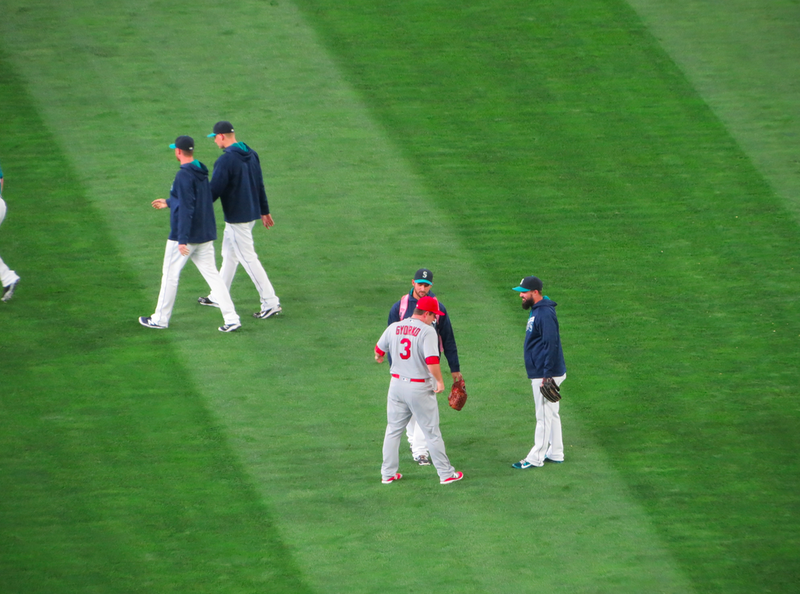 Nick Vincent and Steven Cishek drop by to say hi to Jed Gyorko as they head to the bullpen. I don’t know why the pink backpack has been foisted on Cishek, but here we are. 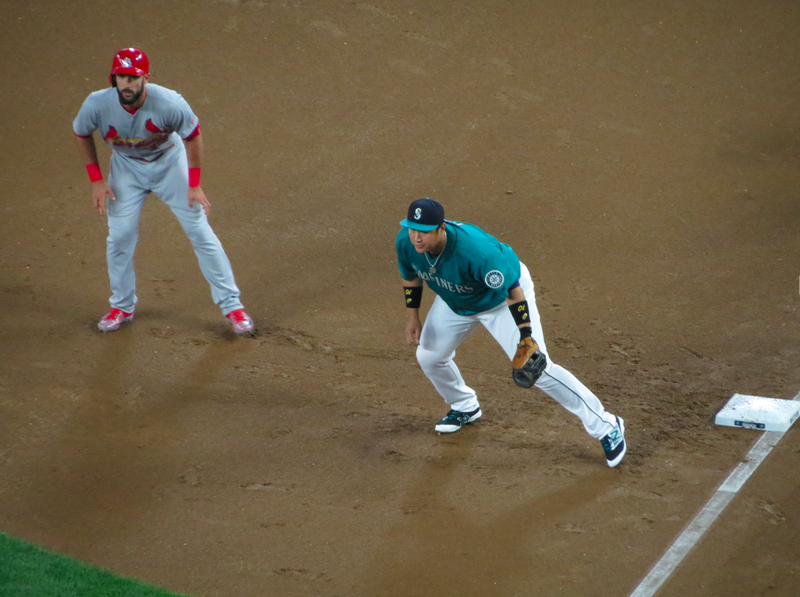 Dae-Ho Lee prepares to go after a ball, while an unidentified (by me) Cardinal gets ready to make a run for it. 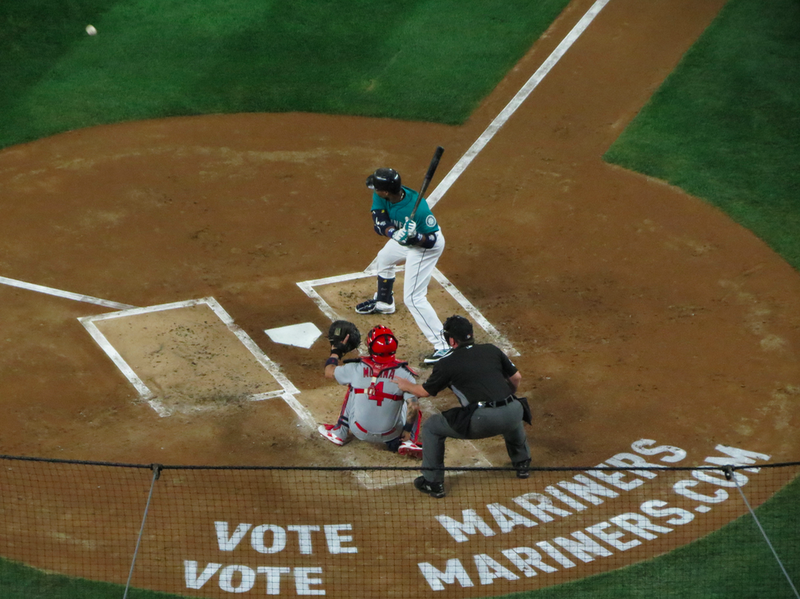 Leonys Martin takes a hack. 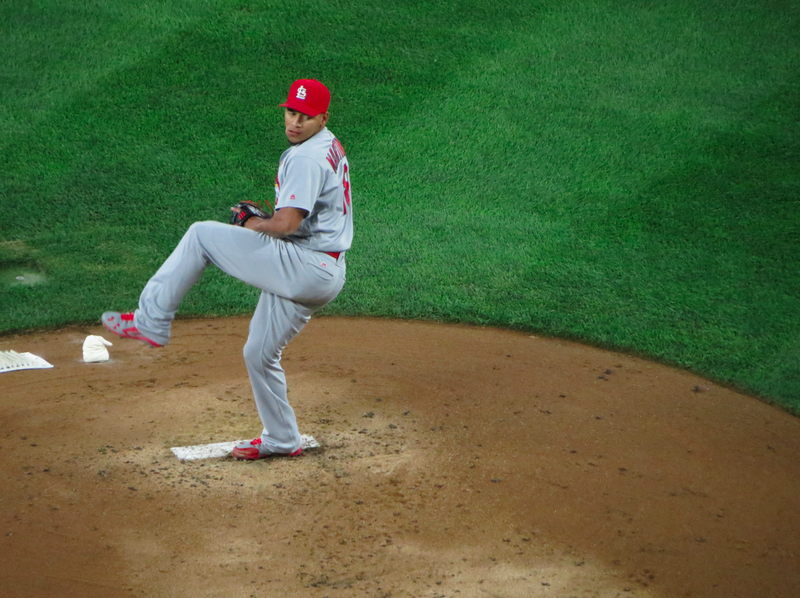 Cards pitcher for the night, Carlos Martinez. 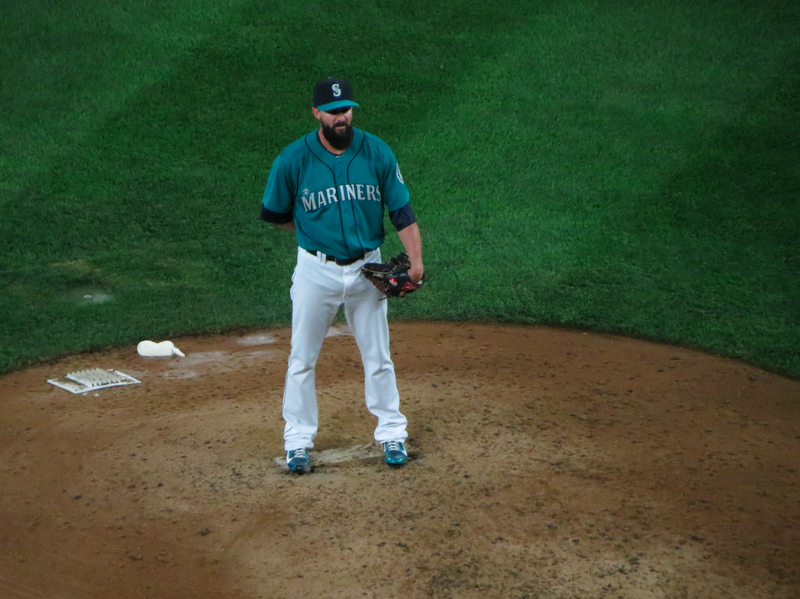 He kept the Mariners bats pretty silent for a solid 7 innings (outside of a bit of struggle in the 6th where we finally made it onto the board with a little bit of small ball) before being replaced by Seung Hwan Oh, who worked short relief in the 8th and kept things nice and tidy for St Louis. 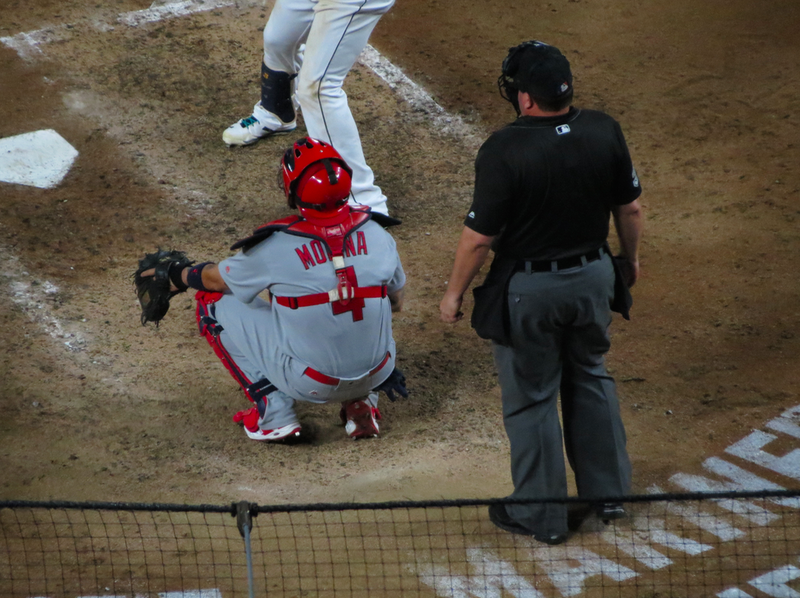 Leonys Martin, waiting for another pitch to get to the plate. 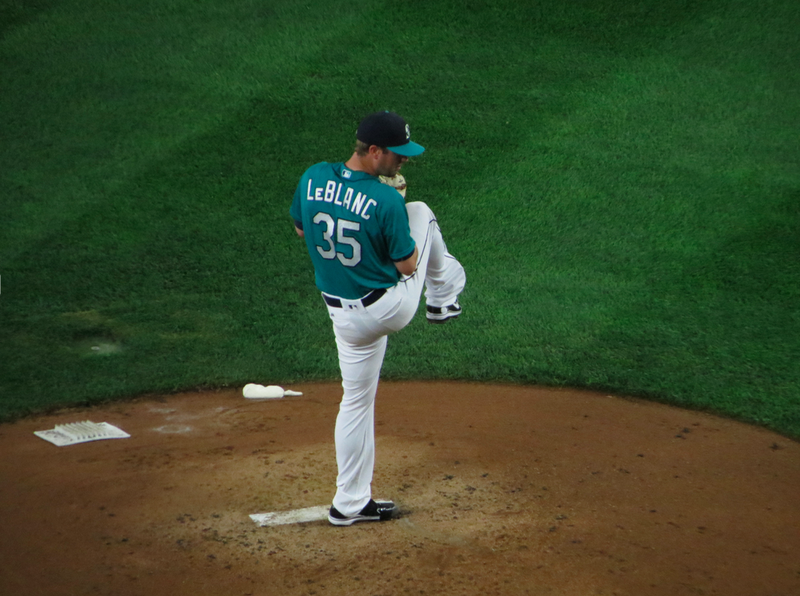 Pleasant surprise of the evening Wade LeBlanc, in his first Mariners start after having come over from the Blue Jays’ triple A team. I don’t know off the top of my head what his final line was, but he sure didn’t give anyone any runs. 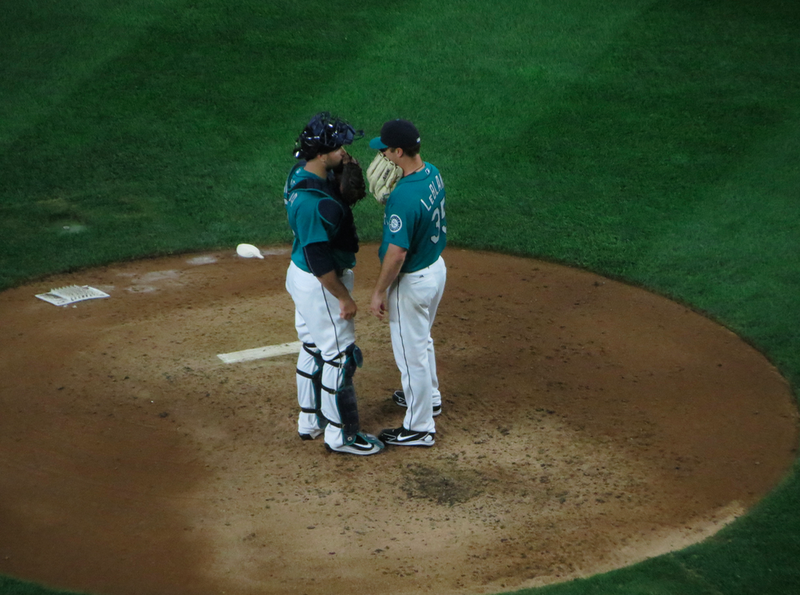 That was, sadly, Joaquin Benoit’s job. Dae-Ho Lee, taking a good swing. LeBlanc and Chris Iannetta have a chat. 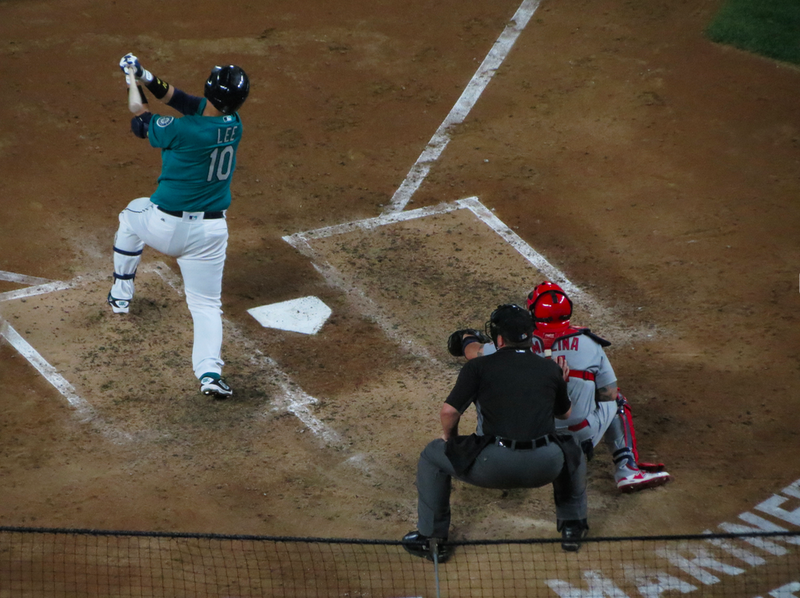 The Mariners load up the bases for Dae-Ho Lee in the 6th. Everyone of course was hoping for the grand slam, but Lee grounded out to sacrifice himself and run Seth Smith in for our first run of the game. Nick Vincent regards the plate in the top of the 7th. This is Yadier Molina. You can’t see them, but he has the prettiest eyes in baseball. And that is some next-level hard-hitting baseball analysis right there. 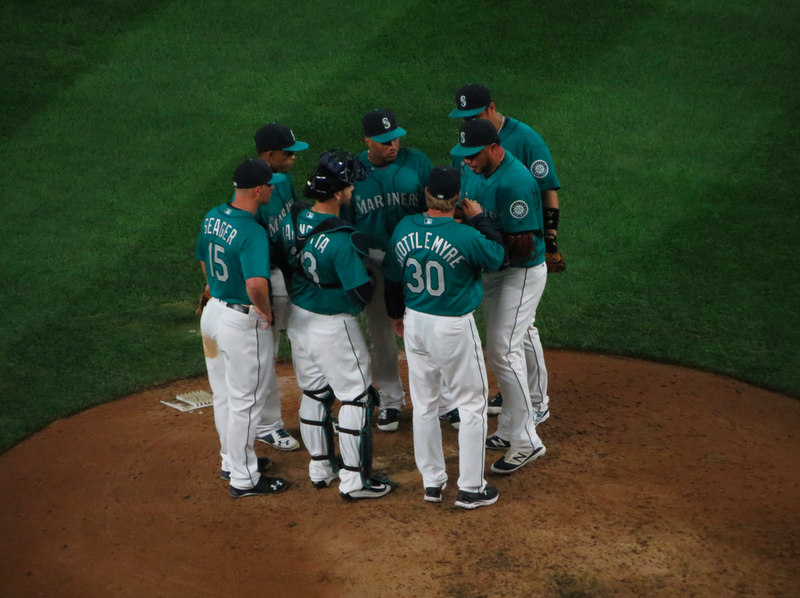 The infielders and coaches have a hill meeting before what I was positive was going to be our downfall that night; Joaquin Benoit. Benoit gave the Cardinals three runs in the top of the 8th, something that we have all kind of come to recognize as generally the end of any given game when it happens. I’m still not sure if this is the pessimistic nature of Mariners fans, or if we’re realists, or what; but I was pretty convinced that things were not going to go well for us. 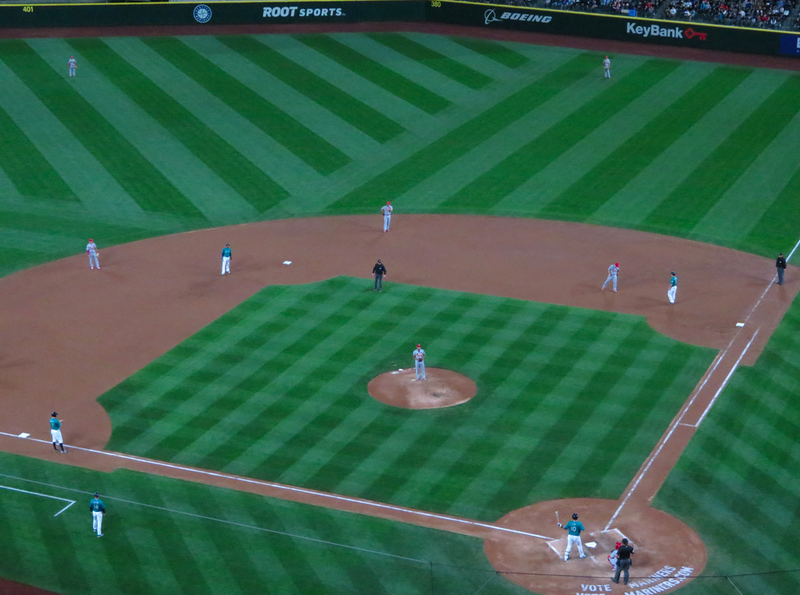 But of course they did; Kyle Seager and Dae-Ho Lee managed to get on base in the bottom of the 9th, and Adam Lind took RHP Trevor Rosenthal to school over the right field wall. I was attempting to finish responding to someone on Twitter when it happened; so I didn’t see the ball leave the bat. I heard it though, and I heard the gradually-ascending roar of the crowd as everyone realized that yes, that ball was in fact going to clear the warning track – quite easily, I might add – and I just stood there with my friends Patrick and Tom feeling terrifically confused. Seriously, it blew my mind for a good few hours the following day after I woke up. Baseball is weird and crazy sometimes. 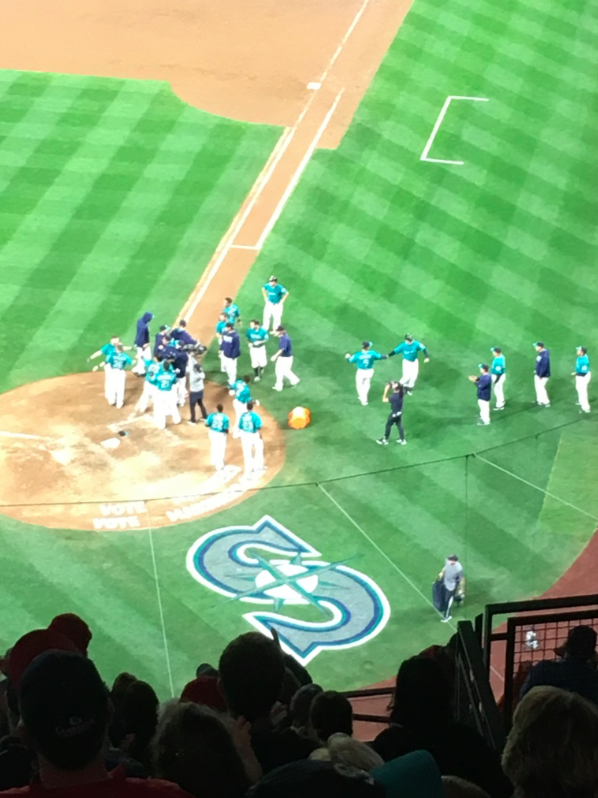 This is the only photo I had time to snap, and the video of the hit and Lind basketballing his helmet at the other guys is here (Gatorade toss also). I could watch that clip over and over, and I’ve seen another one a few times. Absolutely incredible. 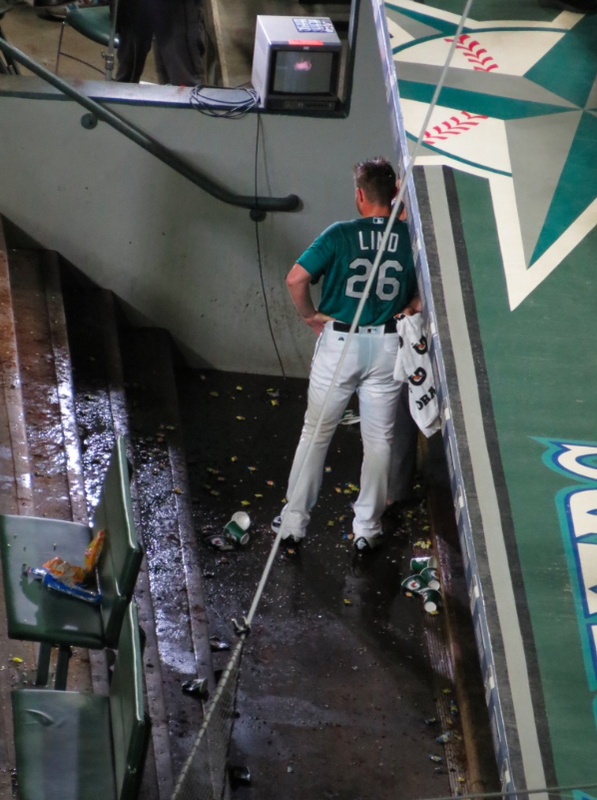 Lind being interviewed in the dugout after having more Gatorade tossed at him (you can’t see Jen Mueller, she was under the awning there). We took the series from the Cards, which was nice, particularly after the bad road trip. I was unable to make it to the other games due to time and money – I was in the Pride parade on Sunday – but I kept track on AtBat, as I am wont to do if I can’t be in front of a TV. As I post this, the Pittsburgh Pirates are in town – another team we have not seen for a few years now – and Hisashi Iwakuma is working a good few innings so far. Wade Miley and Taijuan Walker are on the verge of returning to us, and Felix will be back after the All Star break mid-July. Nathan Karns has been moved to the bullpen as a temporary fix for roster numbers as pitchers come back to the rotation, which is fine with me. Karns has a 6-2 record this year, and it’s nice to have his arm in relief, if they want to keep LeBlanc in for a bit and Miley’s coming back soon. Keep those arms active! I won’t be able to finish this game because of work tomorrow, but the Pirates just made a crazy error at first with pitcher Jonathan Niese aiming at ex-Mariner John Jaso and failing to make the connection. Shawn O’Malley ran into Jaso in a way that could have resulted in a fairly bad injury, but everyone is OK, Jaso laughed it off, and now there are men on the corners. Let’s go Mariners! Lesson is never take your eyes off the game at the end. You just never know what may happen. Thank you for the link to the actual hit. I even watched it twice. Great writing as usual.